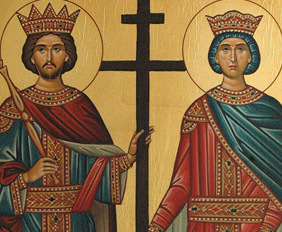 Constantine’s parents were Emperor Constantius Chlorus and the Empress Helena. Chlorus had other children by another wife, but from Helena he had only Constantine. After his coronation Constantine fought three great battles: one against Maxentius, a Roman tyrant; the second against the Scythians on the Danube, and the third against the Byzantines. Before the battle with Maxentius, while Constantine was greatly concerned and in doubt about his success, a brilliant Cross appeared to him in the sky during the day, completely adorned with stars and written on the Cross were these words: “By this Sign Conquer.” Astonished, the emperor ordered a large cross to be forged similar to the one that appeared to him and that it be carried before the army. By the power of the Cross he achieved a glorious victory over the enemy who was superior in members. Maxentius was drowned in the Tiber river. Immediately after that, Constantine issued the famous Edict of Milan in the year 313 A.D. to halt the persecution of Christians. Defeating the Byzantines, Constantine built a beautiful capital on the Bosphorus which from that time on was called Constantinople. Before that, however, Constantine succumbed to the dreaded disease of leprosy. As a cure, the pagan priests and physicians counseled him to bathe in the blood of slaughtered children. However, he rejected that. Then the Apostles Peter and Paul appeared to him and told him to seek out Bishop Sylvester who will cure him of this dreaded disease. The bishop instructed him in the Christian Faith, baptized him and the disease of leprosy vanished from the emperor’s body. When a discord began in the Church because of the mutinous heretic Arius, the emperor convened the First Ecumenical Council in Nicaea, 325. A.D., where the heresy was condemned and Orthodoxy confirmed. St. Helena, the pious mother of the emperor, was very zealous for the Faith of Christ. She visited Jerusalem, discovered the Honorable Cross of the Lord, built the Church of the Resurrection on Golgotha and many other churches throughout the Holy Land. This holy woman presented herself to the Lord in her eightieth year in 327 A.D. Emperor Constantine outlived his mother by ten years. He died in Nicomedia in his sixty-fifth year in 337 A.D. His body was interred in the Church of the Twelve Apostles in Constantinople.